Personalized medical ID's make it easy for first responders and doctors to do what's right when every second counts. Use "ICE" (In Case of Emergency) cell phone numbers on Tags to get confused or lost loved ones back home safely. 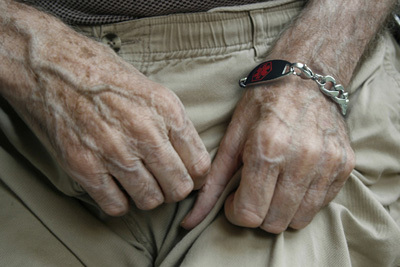 Put bracelet on the “writing hand” so the more difficult-to-handle patients will find it harder to remove by themselves. Get a bracelet early so they understand why they need the bracelet, and they'll be less inclined to remove it later on. Get one they'll like to wear. It may help to have them participate to feel included in their own care. Doing everything for them can make them feel more helpless. Measure wrists carefully so the fit is perfect and snug, but still comfortable. In later stages, they're more likely to pull it off if the bracelet is uncomfortable. 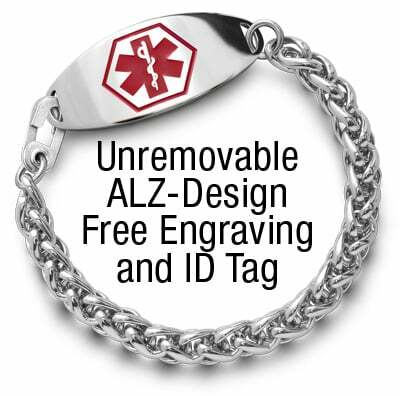 If too loose—dementia bracelets are too easily pulled off without our unremovable design that electronic bracelets can't match. • Benefit from care and support services, making it easier for them and their family to manage the disease. 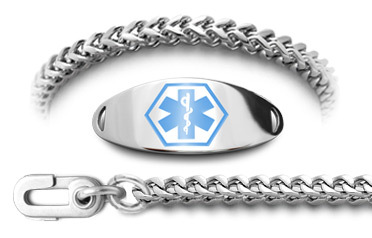 bracelet and Free tag and engraving. 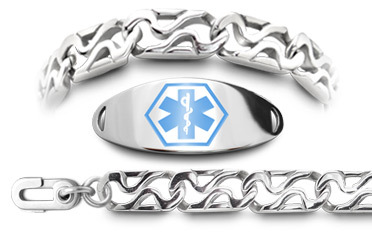 Virtually non-removable unique clasp design and construction keeps loved ones safer than any ordinary medical bracelets. Differences between dementia, Alzheimer’s and memory loss from aging can be hard to distinguish. All are notable problems for older adults although they often are used interchangeably and thus, inaccurately. There is a lot that is unknown about these problems, which is often why they're mixed up in everyday conversation. Dementia is the umbrella term that encompasses impairment of memory and/or thought processes enough to interfere with every day activity. It is a general term often used to describe a set of symptoms associated with a decline in memory processing meaning that the term “dementia” is not in and of itself an illness. Though, it can be caused by a number of underlying problems such as Blood Flow problems to the brain, Huntington’s disease or Parkinson’s disease. Alzheimer’s disease is a type of dementia that affects parts of the brain that specifically control thought, memory, and language. People with ALZ often show signs of confusion, personality/mood changes, memory loss, trouble communicating, and impaired visual recognition of words and objects. One major difference between general dementia and Alzheimer’s dementia is that Alzheimer’s is not reversible where some forms of dementia are reversible. This is not uncommon when growing older. But sometimes it can be hard to distinguish between “normal” memory loss and dementia. Examples of normal behavior for someone who is experiencing age-related memory loss would be making a poor decision every once and a while, missing bill payments, forgetting what day it is and recalling later, forgetting a word they want to use in speech, or losing things. Behavior to be concerned about would be an inability to manage their finances, losing track of the month or season, difficulty carrying on a conversation, poor judgment skills, and misplacing items without being able to retrace their steps. Changes in personality like becoming depressed or irritable when those individuals haven’t been that way before, can be an initial indicator of something more serious. Featuring our unique "scissor-action technology” clasp and a permanently attached ring to the ID tag keeps loved ones safer than ordinary lobster claw clasps. Proven by customers that this virtually unremovable clasp design and construction is more effective to save the memory impaired so they're never lost. 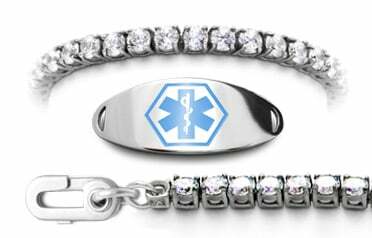 Paramedics look to the wrists first because along with the police, they are trained to always check the wrists first for a medical bracelet. So make sure it's attached firmly to the wrist with all critical medical information for proper care. With only seconds to save a life, doctors and paramedics have no time for phone calls in a real "medical emergency". They must decide quickly what can and cannot be done on the spot. Only in "non-medical emergencies" will the police make calls. Must be worn 24/7 and withstand water conditions such as chlorine or salt water. 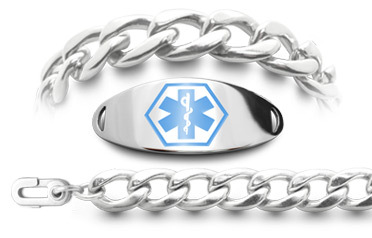 This means a stainless steel medical bracelet is the best choice. Avoid beaded bracelets for memory impaired patients. If you are the “ICE” number recipient, make sure you have a Med info card that lists all medical issues for loved ones, so when called, you can provide useful help. What you need for DNR: Most states will not accept a “DNR” from an ID tag without special paperwork or registration back-up. Check with local paramedics and hospitals for what is needed to honor a “Do Not Resuscitate” request. Once the later stages set in, it’s not uncommon for loved ones to lose their sense of self. 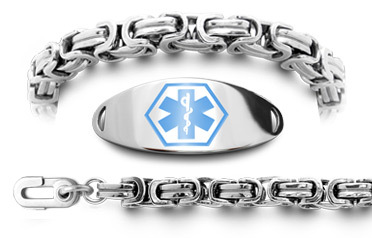 It's now even more crucial to have a medical bracelet in case they wander outside, get lost, and forget where they are or who they are with, or any other myriad of problems that can arise.